The Quinnipiac Bobcats head into the final weekend of the regular season currently in fifth place in the ECAC standings with an outside chance at still getting a first round playoff bye by winning out and getting some help from Dartmouth and Harvard. On Friday the Bobcats welcome their rivals, the Yale Bulldogs who will make the 8 mile trek up Whitney Avenue to High Point Solutions Arena for the 15th annual Heroes Hat Championship. Quinnipiac has won the Heroes Hat twelve times with eight them coming against the Bulldogs. Yale has struggled in the month of February to a tune of a 1-4-1 record as opposed to January when they went 6-1-2. The Bulldogs are trying to right the ship to earn home ice for the first round of the ECAC playoffs. Quinnipiac took the first meeting 5-2 at Ingalls Rink back on February 4th. The Bobcats lead the all time series with Yale 16-6-5. This game can be seen on the SNY network. The Bulldog offense has been quiet in its last six games to a tune of 2.33 goals per game. Over the season they are averaging 2.96 goals per games good for 26th in the country. Sophomore Joe Snively (31 points) and senior John Hayden (30 points) are Yale's two best offensive players by far this season. Both are averaging over 1.1 points per game and are in the top three on the team in shots. They are both threats on the power play especially Hayden who is 5th in the country with ten power play goals. Frankie DiChiara and Ted Hart both have double digit goals this season with 10 and 11 respectively while junior Ryan Hitchcock who has 19 points is out with a broken leg. Its a solid power play at 18.70% (23-of-123) which is good for 26th in the country. 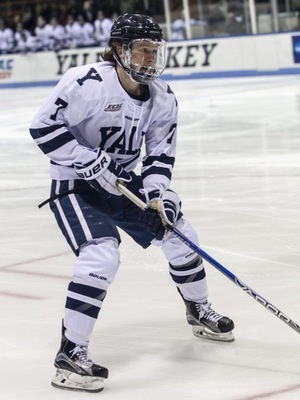 The Yale offense also has not put up big goal totals against any of the top five teams in the ECAC with most of their high scoring games coming against the lesser teams in the conference along with Northeastern and UConn for out of conference opponents. Defensively not much has changed personnel wise since the last meeting with Yale except that the Bulldogs are giving up 3.16 goals per game in their last six games. That has dropped them to 33rd in the country at 2.89 goals per game. That is a big drop off from the 1.88 goals per game they gave up in the month of January. At this point in the season who would think the Yale defense would be taking even more steps forward not a few steps back. Adam Larkin (13 points) and Charlie Curti (10 points) have provided some of the offense from the blue line. What the Bulldogs are missing is the consistent defensive effort each and every game. Its been few and far between this season for them in that department. Yale's power play has also dipped a bit from the last time these teams played as they are killing opposing opportunities at 81.9% (104-of-127) ranking them 36th in the country. In the month of February sophomore goaltender Sam Tucker has gotten the majority of the starts playing in four games for the Bulldogs going 1-2-1 with a 2.50 goals against average in that time frame. On the season in 10 games played the Wilton, Connecticut native is 3-5-1 with a 3.02 goals against average and a .893 save percentage with a shutout of Dartmouth on February 18th. Senior Patrick Spano has struggled in his last 3 games played giving up 12 goals. He started against the Bobcats back on February 4th and gave up 5 goals in the loss. On the season Spano is 8-6-4 with a 2.63 goals against average and a .904 save percentage with one shutout. I think we may see Keith Allain go with Tucker in this one as he is the hotter goaltender at the moment while Spano struggled in his last appearance against the Bobcats. This is a must win for Quinnipiac if they want to have any opportunity to get a top four spot should Saint Lawrence slip up in the final weekend. There will be a little bit of scoreboard watching to a degree in Hamden towards Hanover, New Hampshire when Saint Lawrence takes on Dartmouth tomorrow night. The Bank will be rocking as this is the toughest ticket in town. The fans will do their part tomorrow night while the hope is the team will do the same.